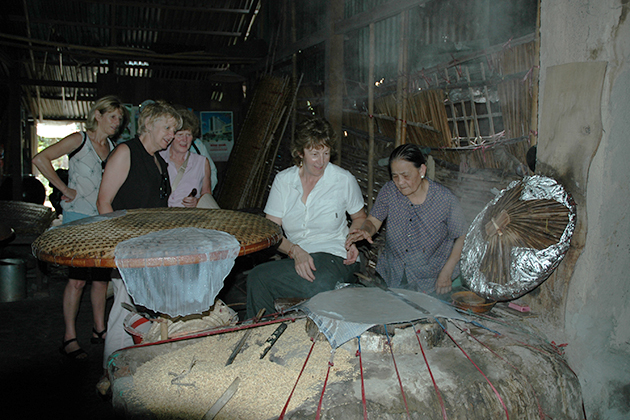 Awake all your senses by exploring the real Vietnam with the well-designed itinerary 2 weeks. 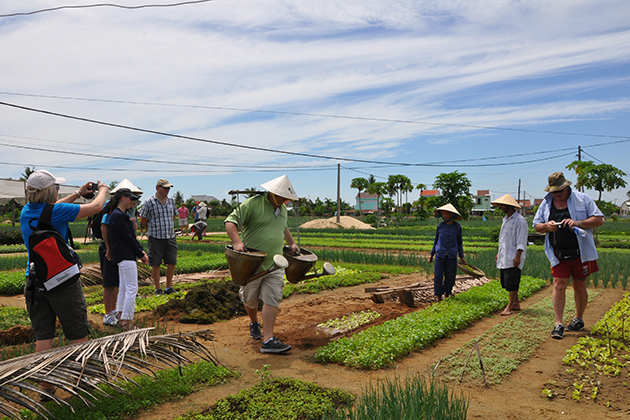 Become not only a spectator but also participate in the daily life of local people by doing easy cycling in the villages' lanes, have two nights at home-stay and learning to cook the wonderful Vietnamese cuisines. 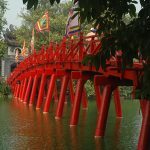 Most of the highlight of Vietnam such as Hanoi, Halong Bay, Hue, Hoi An, Ho Chi Minh City and the Mekong Delta are covered in this thrill-a-minute journey surely stirring your imaginations. 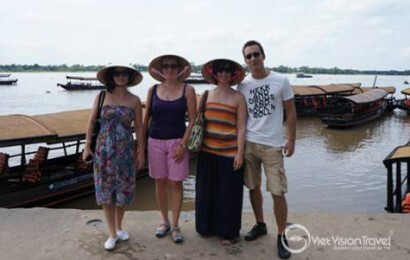 Welcome upon arrival by Viet Vision Travel’s tour guide and the driver then transfer to hotel. Relax in the rest of the day before we enjoy our welcome dinner at a fine local restaurant in town. 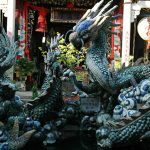 Remark: If your flight to Hanoi in the morning and you are not very tired, join in a half day tour around Hanoi. This morning, visit Ho Chi Minh Complex to see Ho Chi Minh’s mausoleum, Ho Chi Minh’s house on stilt, the Presidential Palace, and One Pillar Pagoda. 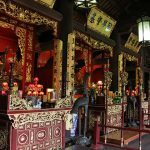 Afterward, see the Temple of Literature which originally built as a temple to Confucius as well as Vietnam’s first university dating back to the 11th century. It is a destination of Vietnamese students for their educational good luck praise. Ho Chi Minh Mausoleum is not opened on every Monday & Friday. 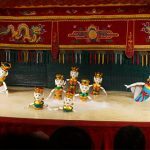 Museum of Ethnology is closed on every Monday. 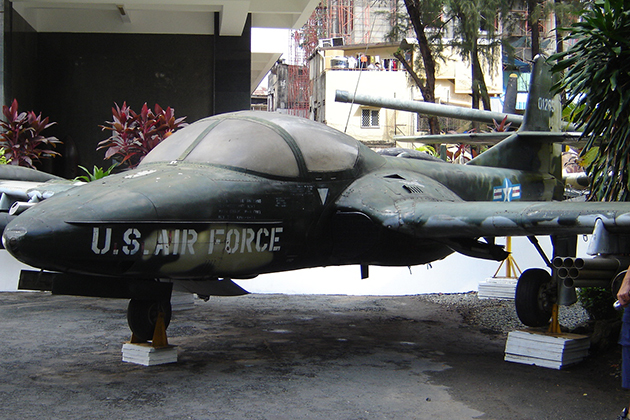 The Museum can be moved to your favorite museum in Hanoi. 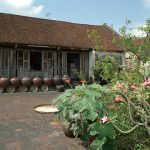 The Moon Garden homestay is located in the outskirt of Hanoi where is not touristic and offers a unique opportunity to experience rural life in Vietnam. The property was originally a summer home for a family of a Hanoi-based architect and gradually expanded with the addition of two new houses. After breakfast, meet tour guide and driver again for Ky Son outskirt village of Hanoi trip. Enjoy a welcome drink by green tea and start exploring the Moon Garden homestay, local market nearby to buy some ingredients for your lunch. Enjoy the meal and take a short rest. 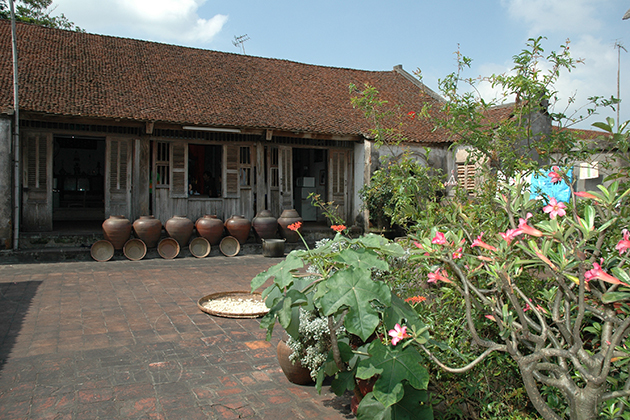 In the afternoon, take a bicycle to discover Duong Lam Village. 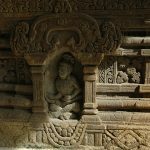 Pedal slowly to fell the peaceful and rusticness filled the air and every ancient house. 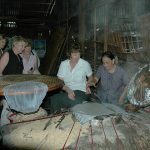 Stop at a local house for a tea break then continue the visit to Mong Phu Communal House, Mia Pagoda and King Ngo Quyen Temple. 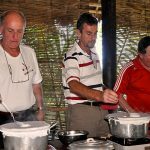 Get back to the homestay, relax your body with hand spa and enjoy a happy hour with the drink or local products such as maize, sweet potato, cassava, peanuts. After dinner, immerse your foot in warm water with ginger, salt & mugwort medicinal herbs before bedtime which brings us a deeper sleep. Overnight at Moon Garden Homestay. Our activities this afternoon are kayaking, cooking demonstration on the cruise, swimming at the beach or climbing up to the top of the Titop island to catch the panorama of the Bay. Enjoy dinner and relax in the evening on the cruise. Get up early morning to join Tai Chi lesson which makes you feel stronger for a long day trip. 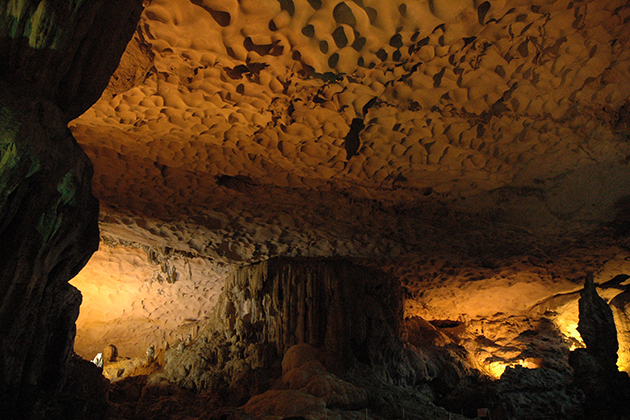 After that, have a light breakfast then take the small boat to Sung Sot cave (Amazing cave). Back to the cruise then we have our brunch is already served. Travel back to Noi Bai International airport for our short domestic flight to Hue where we are welcome by local tour guide & driver. Overnight in Hue. This morning, transfer to the pier for our boat trip along the romantic Perfume River heading out for the countryside. 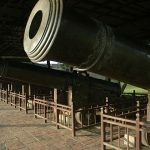 Being the ancient capital, Hue is surrounded by ancient tombs of emperors past, and a visit to the most beautiful tombs will be on the itinerary for today. After breakfast, depart Hue for Hoi An travel through the high pass of Hai Van with its spectacular views of the East Sea en route to Danang. 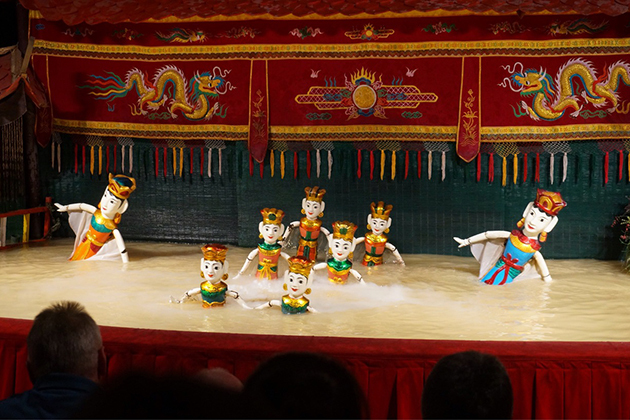 We will visit Cham Museum that has collected and exhibited the finest collection of Cham statues and works of art, the Marble Mountain, My Khe beach and then going to our hotel in Hoi An. Overnight in Hoi An. 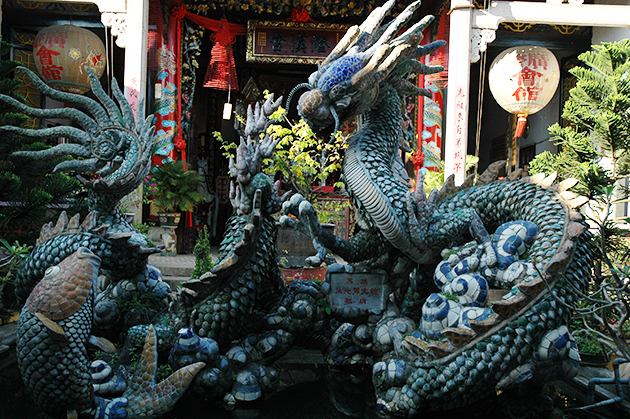 Today, participate in a morning walking tour in Hoi An town – one of the World Culture Heritages of Vietnam. This quaint riverside town still boasts a wealth of century’s old traditional architecture. 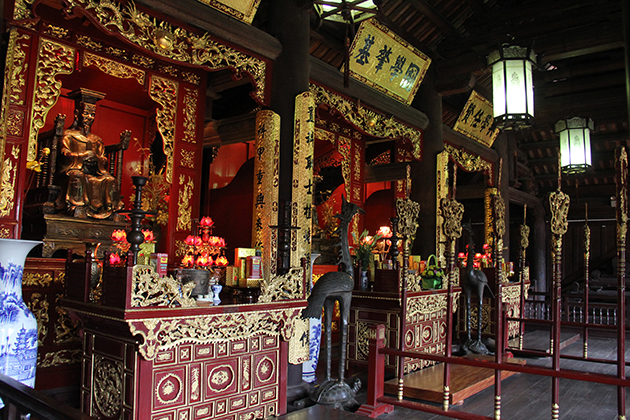 The influences of several Asian cultures can be seen in old houses and waterside buildings. It is also famous as a place to be instantly created inexpensive tailored outfits. In the afternoon, join the fantastic cooking class at Red Bridge restaurant with first activity to visit Hoi An colorful market to experience the amazing sights, sounds and aromas of this busy market, and purchase some of the ingredients to be used in the cooking lesson later. 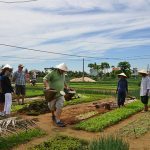 Then, we board the Red Bridge boat for a leisurely cruise (25 minutes) along the Hoi An River to the Red Bridge Cooking School; explore the cooking school’s herb and vegetable garden before learning about some of Hoi An’s and Vietnam’s well-known dishes. 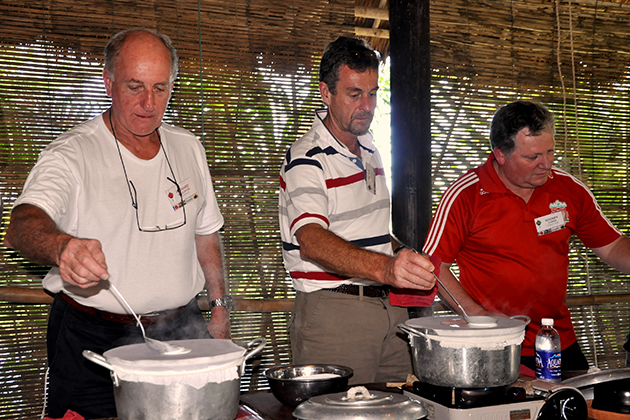 The cooking lesson runs for about 2 hours – each dish is first demonstrated by the Red Bridge chef’s before we prepare the same dish ourselves. 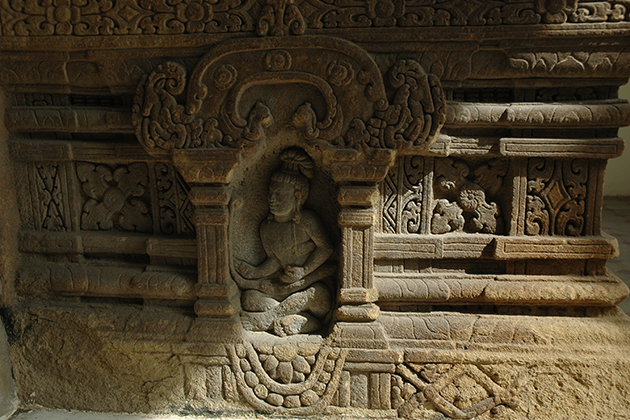 Included in the class is a brief introduction to Vietnamese food carving (plate decoration). After the lesson, we sit down and eat exactly what we have cooked. Overnight in Hoi An. This morning, we can choose bus or bike to cycle to a local farming village to take part in the daily work of local farmers – hoeing and a soil, watering veggie at an organic herb garden, riding water buffalo in the field and enjoy the freshest air of the countryside beauty. 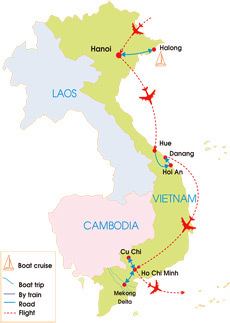 After that, board the Hoi An Eco-tour boat and cruise to the mouth of the river where it meets the Cua Dai Sea. 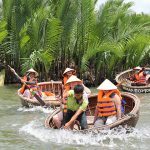 Learn and try our hand at local traditional fishing techniques using round and cast nets, learn to paddle the strange and unique Vietnamese bamboo basket boats there. 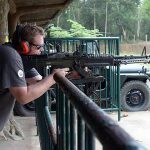 Explore the now tranquil coconut-palm flanked waterways of a past war and hear of the extreme conditions endured by soldiers on both sides. Have a relaxed fun with catching beautiful purple crabs on bamboo basket boat. 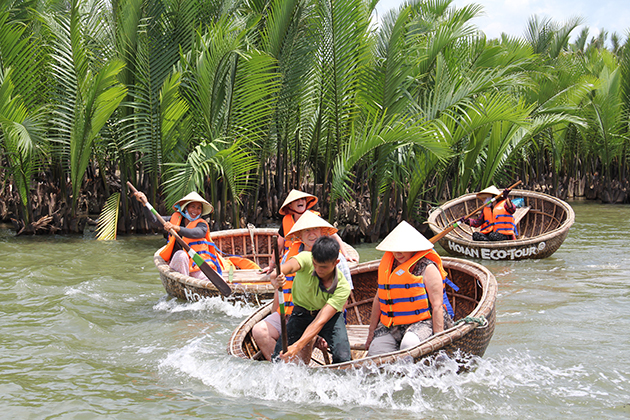 After visiting a local water coconut palm village, take a walk around the village and have some tea and snack with local talks… Back on-board our Hoi An Eco-tour boat, enjoy our lunch then return to Hoi An. Afternoon at leisure. Depending on the weather, we can visit Cu Chi tunnels in the morning or afternoon. Cu Chi Tunnels, otherwise known as the “Iron Triangle” or “Iron Land” is around 70km far from Ho Chi Minh city. It takes us more than 1-hour driving through the pleasant countryside; rubber plantations and rice paddies. 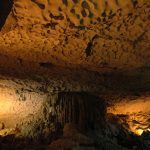 From here, we will have a short time to enjoy the introductory video of how the tunnels constructed; and then explore the maze of the tunnels where are widened for visiting. We also see various mantraps and the remains of a US tank, as well as various bomb craters made by 500lb bombs, dropped by B52 bombers. 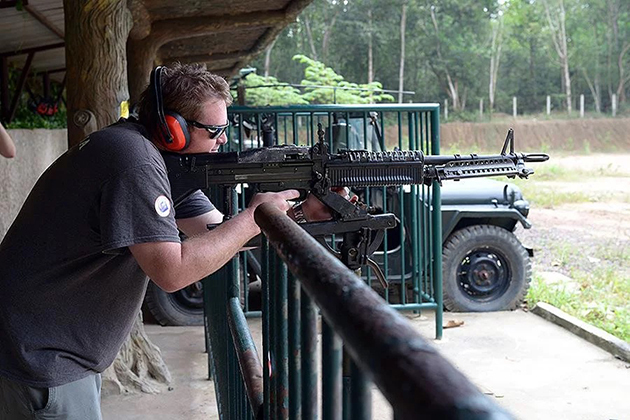 In relaxing time, we may try to use the real guns and bullets (your own paid – US$1/bullet). 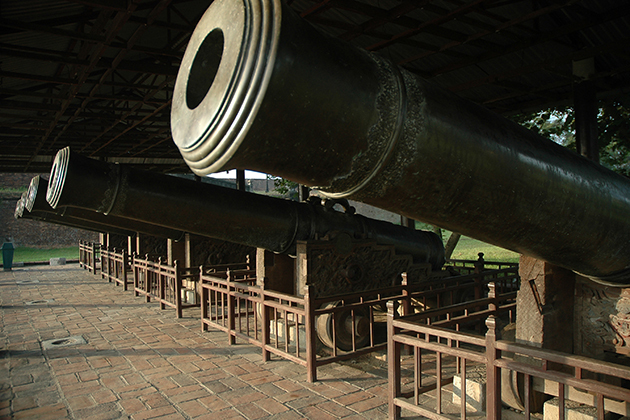 After half-day Cu Chi tunnel tour, travel back to Ho Chi Minh city for our half day city tour. 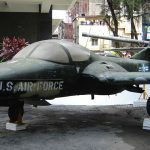 The highlights of this afternoon are the Reunification Palace (the former Presidential Place of the South Vietnam President in the past); the War Remnant Museum where we can see countless artifacts, photographs, and pictures documenting about the second Indochina war; the Notre Dame Cathedral and Old Post Office. Before going back to our hotel, take a short time to visit the Ben Thanh market to buy some local souvenirs and gifts. Overnight in Ho Chi Minh city. 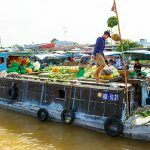 This morning, journey to the south to the Mekong Delta to visit Cai Be Floating Market. 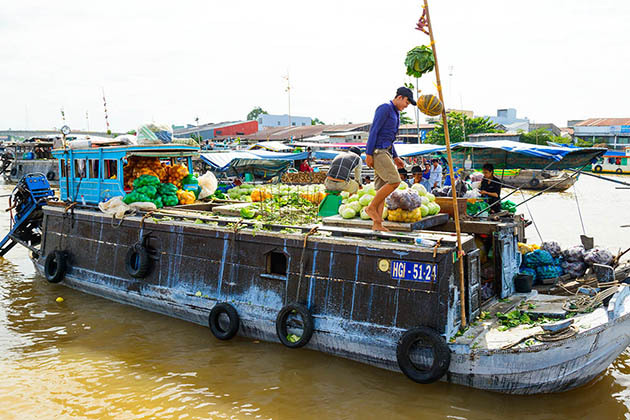 We board our riverboat for a cruise along the endless waterways of the mighty Mekong Delta and stop to visit brick pottery kilns and a floating fish farm. Afterward, we board a small restaurant serving the local delicacies of the river. Later, we will arrive at the lush orchards of the house in which we will spend the night in a homestay with a local family. Overnight in Vinh Long. 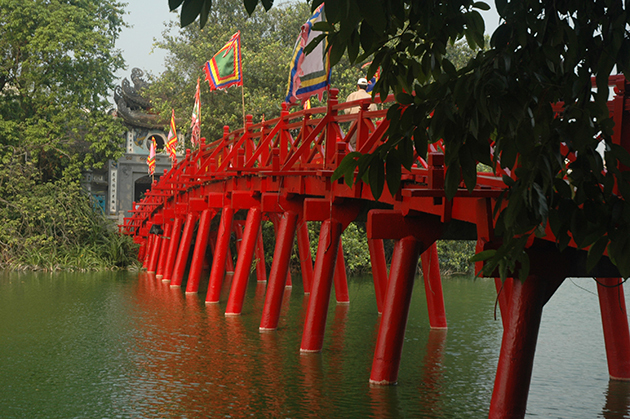 Continue our boat trip along the maze of waterways and canals through An Binh Island. Stop at an old southern house with a bonsai garden and visit some local cottage industries which produce candy as well as rice cakes. Following our cruise, return to the Pier and transfer to our awaiting vehicle to return to Ho Chi Minh City. Today our awaiting vehicle will take us back to the airport to take a flight to home. 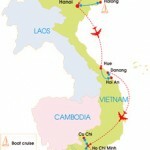 Vietnam tour itinerary 2 weeks ends.